We’ll add news updates and photos of Shaun from time to time on this page. 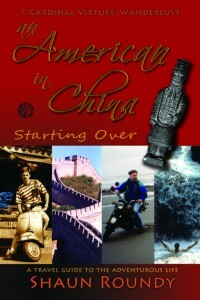 September 26, 2011: An American in China: Starting Over. A Travel Guide to the Adventurous Life. 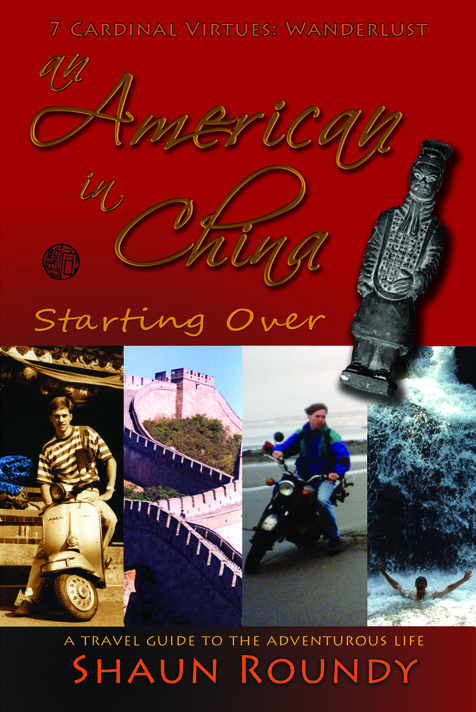 Shaun’s second book – an account of his spontaneous trip to China – was re-released this week with a new internal and cover design and minor revisions. The book is written as 254 pages of vignettes that paint a detailed picture of what the adventurous life is all about. Stories include half a dozen near-death experiences as typhoons nearly wash a group into the ocean and send steep, shale mountains crashing right at Shaun’s feet; a river race, riding bikes, motorcycles and trains, meeting strangers and turning them into friends, romances, learning a new language, finding work teaching English in Taiwan and Beijing, exploring some of the most beautiful scenery on earth, starting over and ending again and again, and much, much more. 130+ photographs add to the interesting reading experience. Find more details or order from the University of Life. August 3, 2011: Did you know that This. was written about the actual valley where Shaun lives? Yep, all those places are real: the big lake, the mountains and canyons, the river trail, Timpanogos High School, the gas station, everything. Ridge Road is even real – and just two streets down the hill from his house. 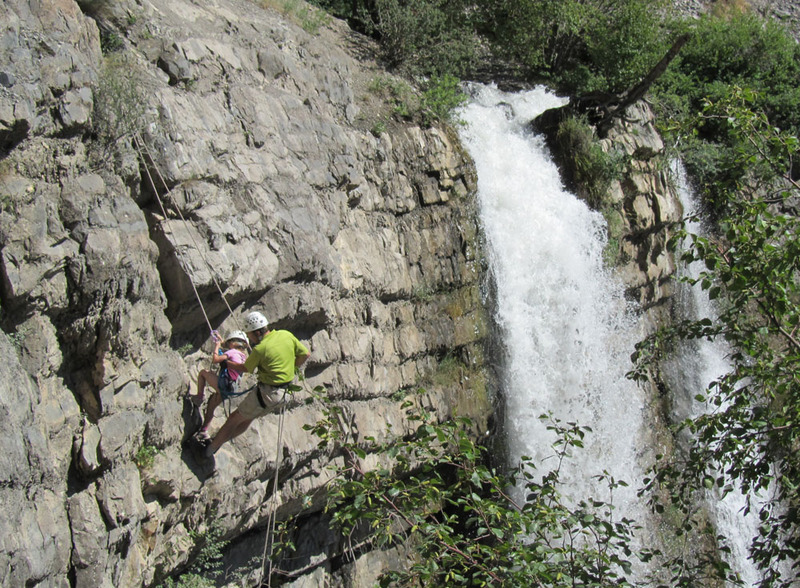 Here’s the next little canyon north of the neighborhood – Battle Creek – where Shaun took his nieces and nephews rappelling next to a waterfall this summer, in the ongoing effort to maintain “favorite uncle” status. This is his audacious 6-year-old niece who rappelled several times as long as he kept one hand on her harness. 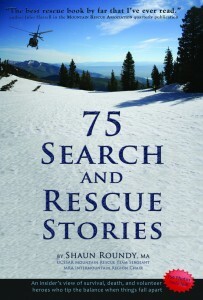 July 4, 2011: 75 Search and Rescue Stories. An insider’s view of survival, death, and volunteer heroes who tip the balance when things fall apart. After many years of planning to write this book, it finally happened. Now you can read over 75 of the best rescue stories from the past dozen years on the world-class Utah County Sheriff Search and Rescue team. 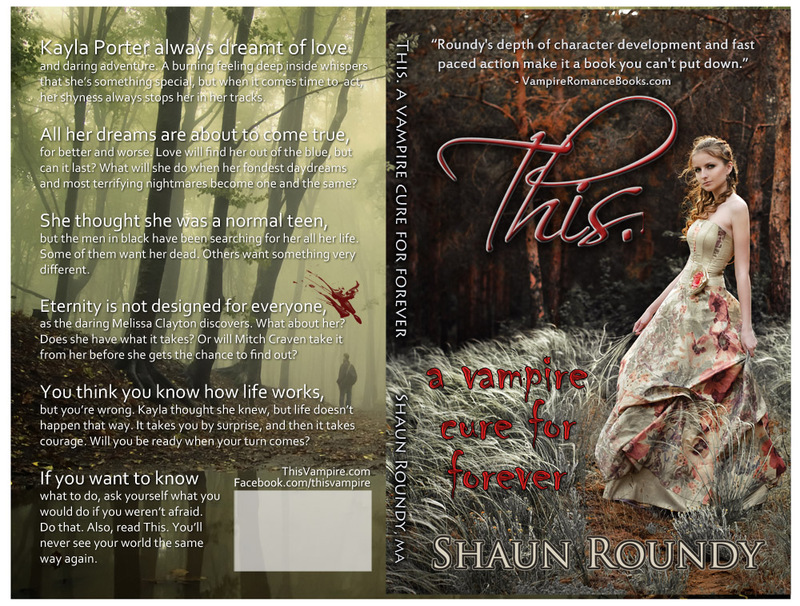 Shaun tells the stories from two perspectives – the victims’ and his own. Telling the victims’ stories of how they got into trouble (though in many cases missing details were made up to fill in unknown gaps) makes the stories all the more gripping, and the rescuer perspective is told intimately, revealing what it’s like to save lives on a regular basis. 150 photos further paint the picture. Utah County itself is is an extreme place, with rivers, lakes, caves, trails, snow, and steep, cliff-filled mountains rising over 7,000′ above the valley floor. You get a distinct taste of the flavor of adventure in these highly-descriptive stories. Read more information and order from UCSSAR.org – find out why author and rescuer Jules Harrell reviewed it as “The best rescue book by far that I’ve ever read” in the Mountain Rescue Association’s Meridian. 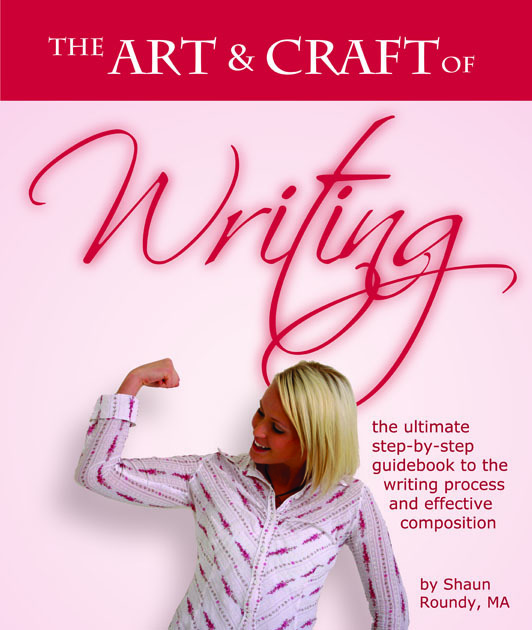 This text has been written over more than a decade of teaching university writing. 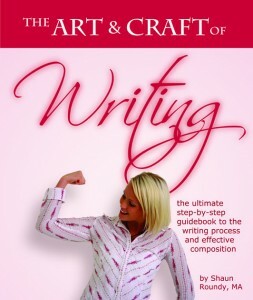 Its 40 chapters cover essential Foundational Concepts for writers (purpose, audience, strategy, rhetoric, style and more), Writing Habits & Processes (the thinking process, research process, reading process, writing process and creative process), many Writing Skills (development, structure, transitions, conclusions, research sources & formatting, show not tell, abstract & concrete, sensory details, action verbs, dialogue, contrast, comparison, rhythm, etc. ), and Extras such as a hundred pages of sample papers. 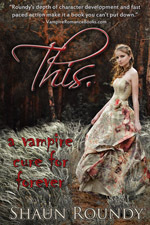 Two additional brand-new books have just been released on Amazon Kindle – find them all on Facebook! 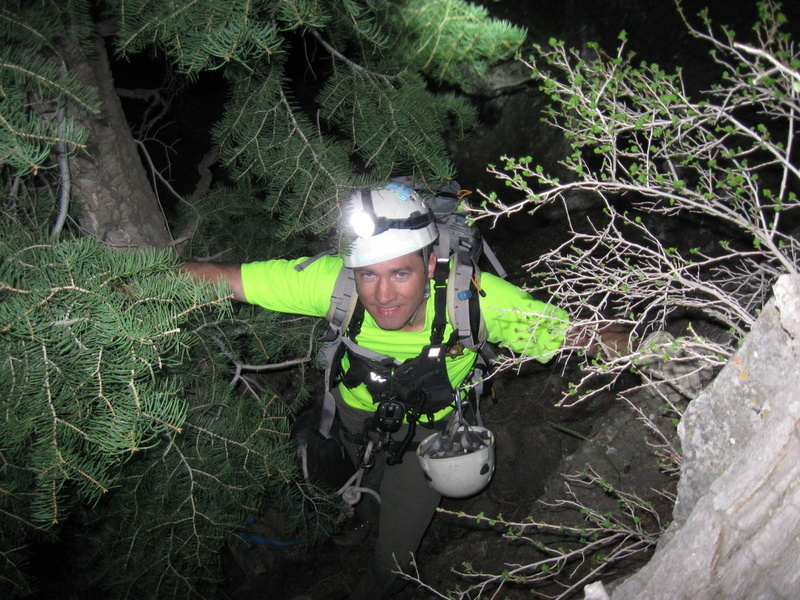 May 16, 2010: as National Search and Rescue Week began, Shaun was assigned as team leader to rescue three men stuck between 200′ cliffs in American Fork Canyon near Timpanogos Cave National Monument (where he worked the previous year as a Ranger). The team of four rode motorcycles up the Timp Cave trail, then hiked down canyon above 200+’ cliffs, over snow and scree, and finally rappelled 200′ to reach the men. In this photo, Shaun prepares to rappel from webbing tied to a pine tree. The men were uninjured though cold and caught in an extremely dangerous spot. Shaun’s team lowered them another 200′ to waiting rescue teams below who walked them down the mountain to the highway. Shaun is currently the Mountain Rescue Team Sergeant and Webmaster for the volunteer Utah County Sheriff Search and Rescue team, and the Mountain Rescue Association Intermountain Region Chair. December, 2008: this video trailer shows highlights of a climbing trip to the Chilean Andes where Shaun and his dad attempt to climb 17,795′ Cerro el Plomo. Eight climbers left advanced base camp that morning, and three reached the summit, Shaun included. Find 79 more photos and the complete story at http://www.summitpost.org/cerro-el-plomo/472598 (click any photo to open the album).